We just witnessed the unveiling of a large oil painting here in the School of Physics and Astronomy, inspired by the first ever detection of gravitational waves. Penelope Cowley, a local artist who specialises in bringing art and science together, presented her work at an unveiling ceremony, along with a video showcasing a unique artistic spin on the discovery. 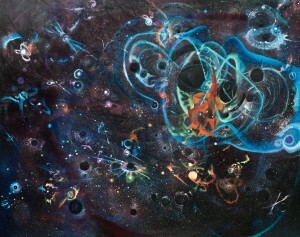 The painting combines a visualisation of data taken from the equipment used to detect the first gravitational waves along with an imagination of some of the celestial bodies that are responsible for creating these waves, such as binary black holes and neutron stars. The video was created in collaboration with Chris North and Ed Fauchon-Jones, as sound engineer Jason Charles Rogers, and includes the actual ‘chirp’ of the gravitational wave that was detected. First proposed by Albert Einstein in 1916, gravitational waves are tiny ripples in space-time that are emitted throughout space as a result of extremely violent cosmic events. Researchers from the School of Physics and Astronomy played an integral part in the LIGO (Laser Interferometer Gravitational-wave Observatory) collaboration that detected a gravitational wave for the first time last September, and announced in February 2016. Over the last two decades they have pioneered the methods that were used to make the first detections.